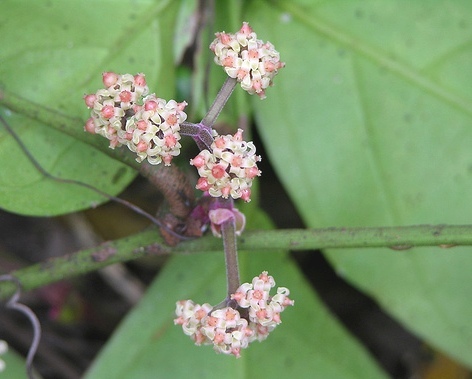 Bherseri is a plant of Indian origin. It grows all over India, including northern region right from Kumaon to Sikkim and Bengal. It is also found growing wild in peninsular India. A large evergreen climber ascending upto 18 m.
Leaves 3 to 5-foliate, somewhat fleshy leaflets, petioles 2.5 to 6 cm long, leaflets stalked 7-13 by 3-5 cm, oblong lanceolate, irregularly cserrate, glabrous. Flowers yellowish or green, 4-merous, dioecious, axillary; male paniculate, longer than the petiole; female cymes denser, corymbose, shorter than the petiole; calyx funnel-shaped, truncate at the apex; petals ovate-ovate, obtuse hooted at the apex, stigma large, four lobed. Fruit a berry, 1.5 cm wide, globose, 2-4 seeded, cream coloured at ripening, edible. Seeds ellipsoid, obtusely angular on the face, rounded and with a single deep groove on the back. The fruit is eaten fresh. It is also cooked with fish. The leaves have medicinal value. A poultice of leaves is applied boils and cures them. 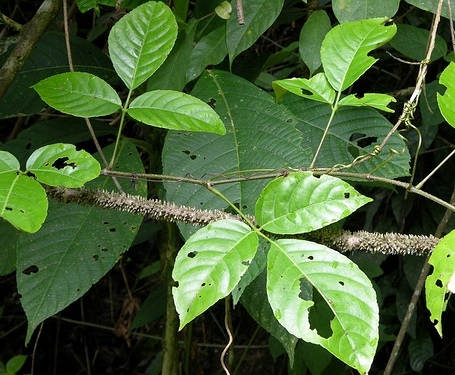 The juice of bherseri plant is used in cough. 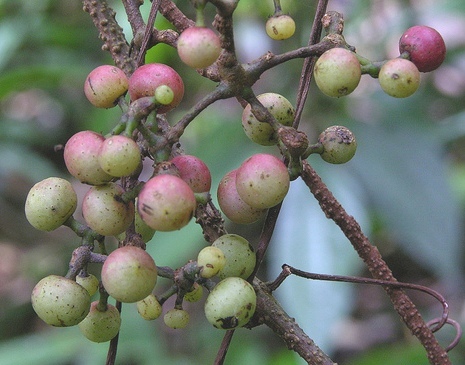 Though the fruits are eaten by local people and there are other uses of this plant besides edible fruits, but still it is not cultivated. However, it should be possible to propagate it by seed as well as from cuttings.